Join JAFA for a tour of the ABC Centre in Adelaide. The tour is likely to include a visit to the studios of ABC 891 Adelaide, A TV studio, a program set, the BtN team, the Newsroom and much more. A fantastic experience for all ages! For more information, please visit ABC Tours. Our Origami & Calligraphy classes for 2017 will commence on Saturday 21 January from 1:30pm at Cowandilla Primary School - 21 Jenkins Street, Cowandilla. Come and join JAFA in farewelling the year at JAFA's annual Bonenkai! We'll be celebrating at Ding Hao restaurant on Gouger Street, with a special banquet menu, with a vegetarian/vegan banquet option. You don't have to be a JAFA member to come along. This event is open to everyone, so bring your friends! Our last two dinner events SOLD OUT! Book early to secure your spot by visiting our TryBooking site. Get ready, Anime fans - JAFA is bringing a new event to Adelaide! On October 22, join us at Prospect Town Hall for AnimeGO!, showcasing some of the latest and greatest Anime, with screenings of classic Anime, Maid Cafe, exhibitions, displays, J-pop, free entertainment, Japanese food and drinks, licensed bar (18+ only) and MORE! Visit the official AnimeGO! 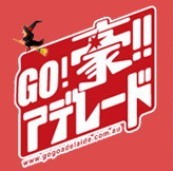 website at www.animego.com.au or follow AnimeGO! on Facebook and Instagram. If you loved our award winning Kodomo no Hi Japan Festival, you'll love AnimeGO! AnimeGO! is supported by the Australian Government through the Australia-Japan Foundation of the Department of Foreign Affairs and Trade. 梅田宏明（ビジュアル・アーティスト＆パフォーマー）"Split Flow & Holistic Strata"
Get ready Anime fans: this October, JAFA will be bringing an exciting new event to Adelaide - AnimeGo! AnimeGo! is an Anime film festival based in Adelaide, South Australia, showcasing some of the latest and greatest anime, with screenings of classic anime, exhibitions, stalls, and Japanese food and drinks. If you loved our multiple award-winning Kodomo no Hi Japan Festival, you'll love AnimeGo! Visit www.animego.com.au for more information about the event, and follow AnimeGo! on Facebook and Instagram for updates. Stay tuned for more information on how to get involved - we'll be calling for performers, stallholders and volunteers soon! If you're pressed for ideas this coming school holidays, JAFA will be holding a special Origami & Calligraphy class for children! To secure a spot, please click here to book via TryBooking. Don't forget, we run regular Origami & Calligraphy classes every first and third Saturday of the month! You are invited to join Australian Red Cross and other community members at a public event to commemorate the atomic bombings of Hiroshima and Nagasaki on Saturday 6 August from 5:30pm - 7pm. Join us at sunset at Elder Park, down from the Rotunda and towards the water, as we use candles, music and messages to remember and reaffirm the call for a ban on nuclear weapons. Electronic candles and message material provided. Event concludes by 7pm. For more information, please click here to view the event poster.